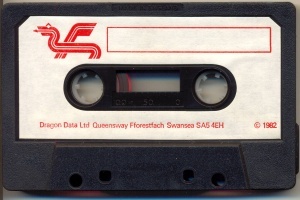 Dragon Data Ltd was a Welsh producer of home computers during the early 1980s. These computers, the Dragon 32 and Dragon 64, strongly resembled the Tandy TRS-80 Color Computer ("CoCo")—both followed a standard Motorola datasheet configuration for the three key components (CPU, SAM and VDG). The machines came in both 32KB and (later) 64KB versions. The history of Dragon Data Ltd in the period 1982–84 was a chequered one. The company was originally set up by a Toy Company called Mettoy, and after initial good sales looked to have a bright future. At its high point it entered negotiations with Tano to form a North American branch. Mettoy then suffered financial difficulties, casting a shadow on the future of Dragon Data Ltd before it was spun off as a separate company. However, a number of circumstances (the delay in introducing the 64K model, poor colour support with a maximum of 4 colours displayable in "graphics mode" and only 2 colours in the highest 256 x 192 pixel mode, the late introduction of the external disk unit and of the supporting OS-9 based software) caused the company to lose market share. To combat this, under the control of GEC, Dragon Data Ltd worked on the next generation of Dragon computers - the Project Alpha (or Dragon Professional) and Project Beta. These systems only made it to the prototype stage before the business went into receivership and was sold on to the Spanish startup Eurohard SA in 1984. Unfortunately Eurohard also suffered financial problems and went into receivership a couple of years later. In addition to the Dragon 32 and Dragon 64, an MSX-compatible machine, the Dragon MSX reached the prototype stage. This is probably the rarest form of packaging left today, not because many were produced but due to the fact that it was just a plastic bag with a cardboard 'tab'. This just lent it's self to being thrown in the bin straight after purchase, once again another reason for the amount of loose Dragon Data cassettes. As this style was used from the launch it can be assumed it died out at the same time as the early logo cart boxes (Dec' 82). This form of packaging was used for the majority of all cassette and cartridge software. As this packaging was quite 'fragile' and awkward to get it's contents in an out many were just discarded this is the reason for many loose Dragon Data cassettes and carts about today. This was the first packaging style to appear, so far this style has only been found in use with Cartridges. As some boxes have dates stamped on the inside of the top flap, this style was in use until around December 1982. As with the Dragon 32 boxes there was short lived black style packaging. The side of the box now has a 'window' for the name of the contents to be displayed. The Dragon logos (on the white background) are actually the front of the instructions.Again from dates stamped on the box this style was used from December 1982 for a few months. This style appear to be least common. The front of the box now gets a nice picture in the 'window' and a yellow border.The '32' has now been moved to the insert of the side window and the '32' is removed from the top/bottom and back. Can only guess the impending arrival of the 64 brought this change. Just strange '32' wasn't removed from the front of the box? For where there wasn't a picture available (yet) this plain black cardboard insert with stickers for 'NEW TITLE' and the title of it's contents, in this case 'Pixel Editor'. All the cassette cases where in the same style, on some covers the title appears where 'COMPUTER SOFTWARE' is printed.Later on many items where sold as 'Reduced Price'. After Dragon Data got into financial trouble Microdeal (who release more titles for the Dragon than any other company) took over the distribution of a few of the titles but still using the Dragon Data inlays. This is a small padded 'box' that is slightly bigger than the cassette it's self. So far this packaging has only been seen on the 'Young Learning' which was part of Dragon Data's Educational Software. I like these :o), they really make you feel like you've bought something, oh yeah and look good, showing off the art work very well. Typical inside of a big box with the tape on the left and instructions right. This packaging must have been especially designed for Dragon Data as the insert below the cassette is used to hold carts. (such as All Dream). This page was last modified on 18 December 2016, at 22:56. This page has been accessed 88,401 times.